YASNY, Russia ― South Korea on Thursday successfully launched a new science satellite, beginning a two-year mission to search for clues about the evolution of the universe. 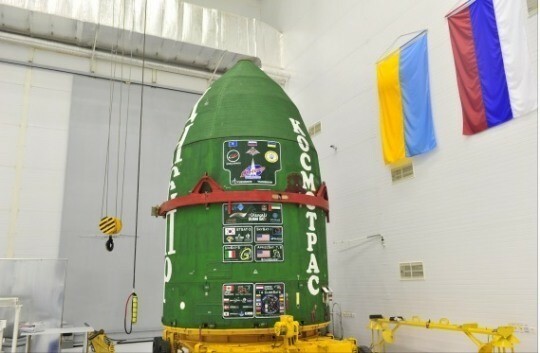 The Science and Technology Satellite-3, or STSAT-3, blasted off at 1:10 p.m. aboard a Dnepr launch vehicle from the Yasny launch base in southern Russia near the border with Kazakhstan. The three-stage, liquid-fueled Russian launcher sent the 170 kilogram satellite into orbit approximately 600 kilometers above sea level. The launch vehicle “successfully released the STSAT-3 into our target orbit around Earth exactly 929 seconds after lift-off,” the launch team in Russia said. “It’s a great relief after all the things we’ve been through to prepare this moment, over the past seven years,” Rhee Seung-wu, the STSAT-3 program manager told The Korea Herald. Controllers confirmed that initial contact with the satellite was made at 2:40 p.m., 89 minutes after lift-off at a ground station in Svalbard in the Arctic Ocean. The satellite was to make its first contact with the ground station in Daejeon, South Korea about six hours after its launch or at about 7:10 p.m. to confirm its successful launch and condition. The signal will prove that the space observation satellite is operating normally. The launch carrying the STSAT-3 along with about 20 other satellites, including the Korean import DubaiSat-2 satellite was projected on a screen in a conference room, some 30 kilometers away from the launch site, with about 70 officials watching. The STSAT-3 is Korea’s first satellite that will study the relic radiation from the Big Bang. Its main missions are: astronomical observation, galaxy imaging and relic infrared imaging for scientific and environmental research. The STSAT-3 is equipped with infrared light captors that can tease out the faintest relic radiation from the cosmic microwave background that could provide clues about the evolution of the universe. The satellite is also designed to measure temperature changes on Earth’s surface. Also, it will test core space technologies, including a new type of lithium-ion battery and the multipurpose composite structure with which the satellite is equipped. The STSAT-3 project has been in development with a total investment of 27.83 billion won ($26.1 million) since 2006. If the launch is successful, the satellite will begin operating after a three-month test period for two years in a sun-synchronous orbit, which means it will pass over the Earth’s surface in time with the planet’s rotation, so that the time of day on the ground below is almost constant.